We have all heard about the health benefits of juicing, but too often we simply do not have the time, or do not want to deal with the messy clean-up so often associated with juicing. Fortunately, the Vita-Mix 1300 TurboBlend 4500 is both fast and efficient, and requires minimal clean up. The Vita-Mix is much more than your average juicer or blender. You can make juice, smoothies, soup, purées, and even grind flour and make your own nut-butters. This is due to its powerful 2+ peak horsepower motor and strong stainless steel blades. The Vita-Mix makes it easy to be healthy! One of my primary concerns when researching juicers was that I wanted a high quality juicer, but I also needed a powerful blender and I did not have the space, nor could I afford both. Quality juicers are very pricey, but can only do one thing, which is juice. I have owned juicers in the past and have ended up never using them because the clean-up is so messy and time-consuming. I like to have a vegetable juice or a fruit smoothie in the morning for breakfast, but never had the time to make them and do the clean-up before going to work. 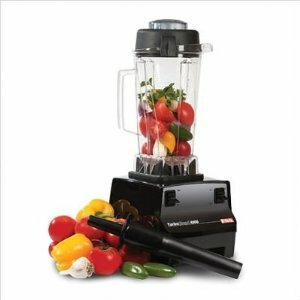 With the Vita-Mix TurboBlend 4500 I only have to have one machine on the counter and I can alternate between vegetable juicing and fruit smoothies. Since there are very few separate parts, I can just rinse it off, so clean-up is very quick! Also, as the Vita-Mix is so powerful, I do not have to spend time chopping and cutting up vegetables into small pieces to fit into the juicer. I can just throw everything in and go, with a healthy juice or smoothie in my hand and a clean machine in under five minutes. One thing that makes the Vita-Mix different from other juicers is that with the Vita-Mix the pulp remains in the juice, while with other juicers all pulp is removed. In the beginning this concerned me because I really wanted juice, not just thick smoothies. In fact, this almost deterred me from purchasing the Vita-Mix. The juice from the Vita-Mix is very smooth and it can emulsify even harder vegetables and leafy greens in seconds flat, with no bits left over. However, the juice is a bit thicker than you would get with a normal juicer. One solution I have found is to add some water and strain the pulp out with a nut-milk bag or other strainer. I also read that pure juice can make your insulin levels go up, and so it is actually healthier to drink juice with the pulp included. The pulp also provides you with fiber which is very good for you! All good juicers tend to be on the pricier side. Even though the Vita-Mix 1300 TurboBlend 4500 is the least expensive model of Vita-Mix, it is still quite expensive. However, it would have cost me much more to buy both a juicer and a blender while also receiving a high-quality, sturdy product. Juicing does incredible things for your health, yet you will not receive those benefits if your machine takes too long to use or is too annoying to clean-up. The Vita-Mix is so fast, efficient, easy to clean and versatile that I use it almost daily. The Vita-Mix 1300 TurboBlend 4500 makes it so easy to be healthy!